The V10 steel conditioner rolls feature 10 angled flutes arranged in a chevron, or V-pattern along the length of the steel core. 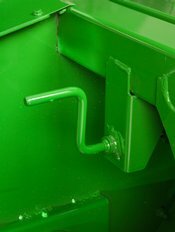 A swathboard is in base equipment for additional control of windrow formation. 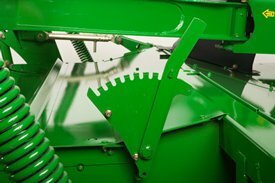 The wide swath kit is a factory-installed option for the 630, 635, 830, and 835 Mower-Conditioner models. 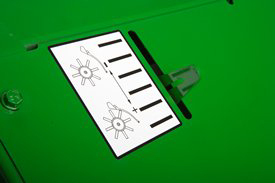 When equipped with an impeller conditioner the kit consists of a redesigned, base swath board and four (3.0-m [9.8-ft]) or six (3.5-m [11.5-ft]) steel vanes bolted to the bottom of the swath board. On roll conditioner machines the kit also comes with a redesigned, base swath board but has six (3.0-m [9.8-ft]) or eight (3.5-m [11.5-ft]) steel vanes. 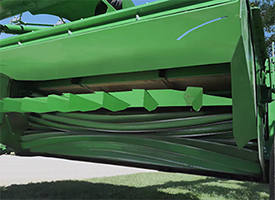 When the forming shields are fully open, this kit will increase windrow width up to 25 percent over the base configuration of the machines. 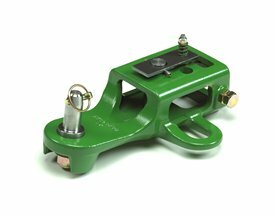 For added maneuverability, the 830 and 835 Mower-Conditioners offer an optional rockshaft swivel hitch. 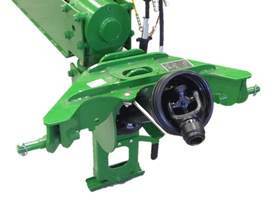 The swivel hitch includes an overrunning clutch behind the primary driveline to enable free rotation of the tractor hookup to make attaching to the tractor easier. This option enables cutting square corners without the need to reposition the platform using tractor hydraulics, as well as making it easier to cut around field obstacles. U-joint angles remain constant for reduced driveline noise and vibration in turns. A powerline support cable keeps the driveline out of the dirt when detached from the tractor. A parking stand allows quick and easy hookup. 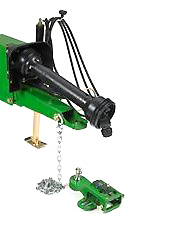 A down stop chain is also included to limit travel of the rockshaft to prevent damage to the implement driveline. on New John Deere Hay & Forage Mower Conditioners.